This article provides a view of the changing thermal conditions during a typical day and a suggested approach to making the best use of these conditions. Most of the background material for this article has been sourced from the Soaring Symposia, In-flight Decisions, and modified for hang gliding. Decision's in flight separate those that succeed, from those that have the potential to succeed. Part of the decision making process is having the background knowledge to make decisions and the ability to execute whilst in flight. This article presents information that can assist with the background information rather than the execution of in-flight decisions. - How the height band changes during the day. The height band is an important consideration in the progress of your flight. Let us start with a definition. The height band is the attitude range within which you should fly. It extends from a safe low level up to cloud base or to a height at which the lift has weakened and to where it is not in the best interests of the flight to continue climbing. Later we will discuss in depth how to determine the lower an upper limits of this band. The limits of the height band are influenced not only by the strength of the lift which is, in turn, a function of the time of day, weather, etc., but also by the terrain, clouds, visibility, task length, and other factors which will be detailed later. The biggest mistake of beginning cross country soaring pilots is staying in a thermal too long, that is, after it is no longer efficient to do so. This is a natural mistake (ed. and one I still make) since the first thing that any hang glider pilot learns is to climb as high as he/she can, period. This is not wrong when a pilot is learning in fact, it is very important for a soaring pilot to know how the top of a dry thermal feels and how to identify it. A big and important step, however, is to learn to leave a thermal when it is still "good" but not good enough to maximise your speed. Let's get specific now and give a general rule of thumb about the top of the height band, or, in other words, what is involved in making the decision to go or when to leave the thermal. In the middle of a good day, on a medium task, when the thermal tops or cloud bases are, say, at least 4000 to 6000 feet above the ground, you should leave a thermal when you are in the upper part and the lift drops to about 75 or 85 percent of the maximum value for more than a turn or two. 1. Cloud pattern ahead did not look as good. 3. Thunderstorm or cu-nim shadow ahead. 4. Rougher or higher terrain ahead. 7. Time to start final glide. On many days with cumulus clouds, the thermal strength increases up to and into the base of the clouds. In this case the top of the height band then becomes the cloud base. Of course, we feel compelled here to mention that you should observe the legal vertical proximity to clouds which C.A.S.A will allow. In deciding how much the seven above mentioned items influence the top of the height band is a matter of judgment depending on each individual case. This judgment is developed with experience. In general, the less experience a pilot has, the more conservative he/she is. If things look different ahead, the pilot with less experience will tend to fly higher before he makes the decision to go. This is correct and natural. The judgment that is involved here is usually the separating factor between champions and almost champions. We have more to say about these influencing factors later. The time of day influences many important parameters of a hang glider flight, not the least of which is the height band. So that we might better improve our mental picture of how these important parameters vary with time of day, a few sketches might be in order. 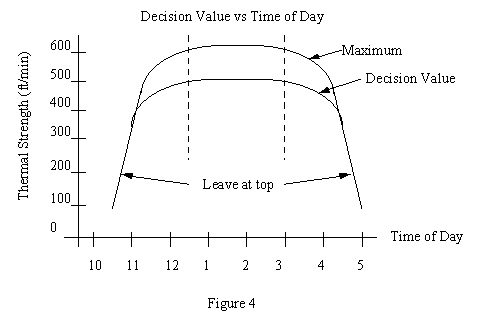 Figure 1 shows how the lift may vary with time of day on a good day. The specific numbers for lift are not particularly important. What is more important is that you develop a feel for the fact that lift will increase rather abruptly once it starts in the morning and will end rather abruptly once it starts to quit at the end of the day. 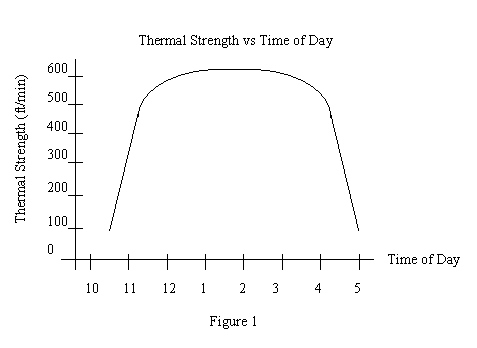 Notice in figure 2 that not only does the thermal strength vary with time of day but so does the thermal height, that is, the tops of the thermals vary with the time of day. In figure 2 we wee that the tops may be only 2000 to 3000 feet when the thermals first start in the morning and slowly rise until the middle of the day at which time they generally stay rather constant until the end of the day when they quit. Many times when you can find that last late evening thermal, the top is often as high as any have been all day. Remembering that these figures represent a typical good day not influenced by any sudden air mass changes or other abrupt factors. 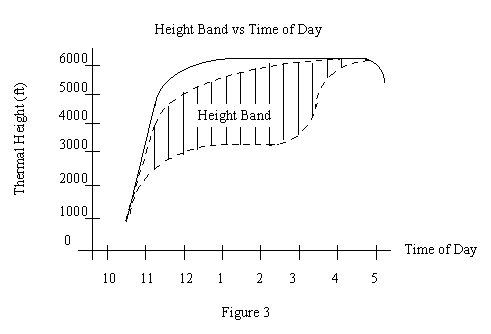 The figure 3 which is a typical plot of the height band vs. time of day. Notice carefully that the solid line represents the tops of the thermals vs. time of day and the upper dashed line indicates the top of the height band which, of course, is some percentage below the tops of the thermals as we indicated earlier. Again, let us remind you that these figures are rather qualitative in nature and the specific numbers on the curves may not be valid but the overall figure does show typical trends. This figure assumes no clouds because the top of the height band is limited by cloud base on many days. A fact emphasised by figure 2 is that if you should have reason to fly at the very, beginning of the day such as you might on a distance task, notice the height band is very narrow at that time and the top is practically at the top of the thermal. As the day gets better and the lift increases, the thermal tops get higher. The height band, therefore, broadens and the difference in height between the thermal top and the height band top also broadens. Another important consideration is that toward the end of the day when conditions begin to "soften up," the top of the height band again goes to the top of the thermal, the bottom of the height band moves up rather rapidly and you become more conservative. There is no substitute for being high at the end of the day! Remembering that the figure 2 is time of day vs. height, let us look at the figure 4, which is time of day vs. climb rate. Do not confuse the vertical axis (climb rate) with the height in feet in figure 3 or the thermal strength shown in figure 2. Climb rate is related to thermal strength in that we try to make our climb rate as high a percentage of the thermal strength as possible. This is a function of our ability to utilise the thermal most efficiently. It is very important to get a good mental picture and a good physical feeling for the true climb rate. 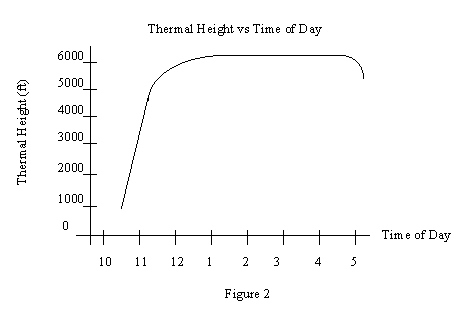 The upper curve is the maximum climb rate that we can achieve in a thermal at any specific time of day (the specific time of day is indicated by a vertical dashed line). The bottom curve represents the rate of climb at which we should decide to leave the thermal or the minimum acceptable rate of climb. In other words, how much must the lift drop off in a thermal before we make a decision to leave? This gets back to the big decision we referred to in the previous section. In the case of this figure, and for the purposes of our study here, we are assuming that things took good ahead and this decision is not influenced by any of the seven parameters mentioned in the "When to go" section 3. Figure 4 shows that at the beginning of the day when the thermals are just starting, our net climb rate is very low and the two curves are together, so we should decide to be patient and leave the thermal at the top. In the middle of the day when the lift is strongest, we make our decision to leave the thermal when the lift drops to about 4/5 of the maximum. At the end of the day we again should make the decision to stay in the thermal all the way to the top as the two curves are together and the net climb rate is again quite low. A few other very important observations can be made from studying these figures. Study them carefully and see if you can understand why during the early part of a distance day, a turn or two at zero sink at the top of a thermal may be called for but such a thing later in the day would be wasteful and therefore intolerable. Tasks such as speed triangles and out and return can be assumed to require a fixed length of time. Considering the meteorological and other conditions, an estimate should be made of how long the particular task should take and, after adding a little margin, this length of time should then be fitted on the time of day scale of the above figures. As an example, the length of time between the two dashed vertical lines in figure 4 would be a typical assumed task time. It would be obviously prudent to utilise the strongest portion of the day for your task. On such a day, first climb to the top of a thermal to check the thermal height and the loss of lift at the top. This is commonly done in competition before going through the starting gate. It is not uncommon in contests or on speed record attempts to take off an hour or so before the anticipated start time. This hour is spent evaluating the thermal height and size as well as how the lift varies in the thermals. From a study of the figures, notice that from middle to late afternoon we should be on guard for "softness" in thermals and a little less "character" to the clouds. When this condition is suspected, we ease the height band up (both the top and the bottom of the band) and as conditions continue to fade, we narrow the band upward all the way to the top. This would be true on a distance day then, hopefully, at the end of the day you would be at the top of the last afternoon thermal and ready to start a final glide at maximum L/D speed.